Sorry to dredge this up from last fall, but the worst thing imaginable in the history of the human race has happened!!! OK. . . that's a slight exaggeration but I did have a problem with my jacket. It had been hanging in the closet since last year with some other jackets, and since the weather has turned cooler lately I decided to wash 3 or 4 of them. This past spring we had a minor war with some moths in our house, and I had found remnants of cocoons on some other clothing, so I decided to wash some items that were hanging in the closet for a while. I didn't really think much of it, but when I pulled my Nostromo jacket out of the machine the lettering had begun to peel off. The iron-on material is so thin, I don't think any kind of fabric glue would have worked to tack it back down, so I grudgingly pulled it the rest of the way off. But now that I look at it, it looks sort of. . . weathered. I dunno. Not sure what I should do at this point. I'm almost liking these ghostly remnants of the lettering. I think if I decide to redo it, I'll go with a stencil and some fabric paint though. *Sigh* Fandom is not without its struggles! 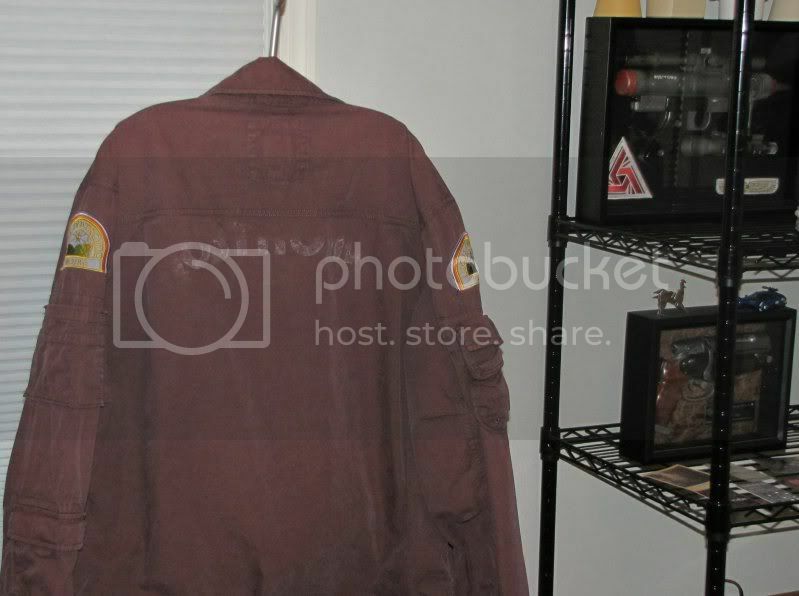 Well, if you love the "used" look, that jacket is now perfect ...maybe too perfect. Might as well re-do the lettering. Ghost from the past bump. Did you ever paint the letters on your jacket? I liked the distressed look but am curious if you redid it. I just picked up a jacket and stencils and am wondering what type of paint to use on it. I've got a genuine mk3 but have never painted onto cloth before. Ouch! I got whiplash from this bump. Yes, I actually did get a stencil from Mike and painted the lettering on the jacket. I bought a bottle of acrylic craft paint from Michael's in a blue green gray shade and mixed it with a bottle of fabric medium. Mixing paint with a fabric medium is supposed to help it adhere better, and sure enough, it's good to go now. I've washed the jacket at least a couple of times since painting the lettering and it's on there to stay. I haven't taken any new pics since redoing the jacket. Guess I should try to snap a couple at some point.